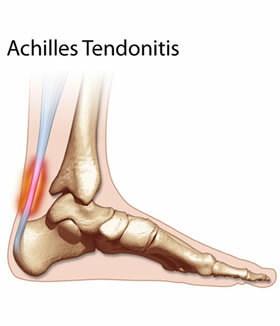 Elevation of the affected foot and leg at rest may diminish the pain. Applying gentle heat to the painful area may ease the pain by dilating local blood vessels. One also can protect the heel by placing a foam rubber pad in the heel of the shoe. A pad about one-half inch thick will raise the heel, shift the weight of the body forward, and protect the irritated muscles attached to the heel bone. The same effect can be achieved by using adhesive tape to turn the foot inward. Additional treatment may consist of a number of physical therapies, such as diathermy, ultrasound waves and whirlpool baths. serafinaadjutant is using Hatena Blog. Would you like to try it too?